On April 4 and 5, 2014 WomenArts and the Mount Holyoke Symphony Orchestra presented the East Coast premiere of Dark River: The Fannie Lou Hamer Story, a full-length opera written and composed by Mary D. Watkins. You can watch archival video clips from this production on the WomenArts YouTube channel. The opera brings to life one of the most turbulent periods in American history. Fifty years ago, Fannie Lou Hamer was one of the first African-Americans to register to vote in Mississippi. She endured severe beatings, harassment, death threats, and imprisonment to secure voting rights for her people. In 1964 Fannie Lou Hamer and the Mississippi Freedom Party challenged the all-white Mississippi delegation to the Democratic National Convention. 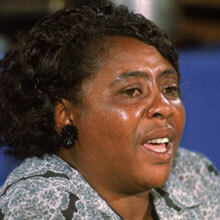 Fannie Lou Hamer gave an electrifying speech that focused national attention on voter inequality. A year later President Johnson signed the Voting Rights Act of 1965, which outlawed discriminatory voting practices. WomenArts Executive Director Martha Richards saw the original production in 2009 and wanted to bring it to larger audiences. She has been working with composer Mary D. Watkins since 2011 to develop the piece and find other venues. The Mount Holyoke performances featured Andrea Chinedu Nwoke as Fannie Lou Hamer, Philip Lima as Pap Hamer, and Miguel Angel Vasquez, Matt Chastain, Farah Darliette, Melynda Davis, Thandiwe Delgado-Kinyatti, Ernest Jackson, Robert King, Synthia Pullum, Aaron Reeder, Craig Simonetti, Robert Stahley, Matthew Stansfield, Mauri Tetreault, Maya Starr Ward, and the 42-piece Mount Holyoke Symphony Orchestra conducted by Ng Tian Hui. Darryl V. Jones, the award-winning director of the 2009 Oakland Opera Theatre production of the piece, directed the Mount Holyoke production. WomenArts is currently working with Mary Watkins to find additional venues for this piece. We welcome inquiries from other professional companies or schools that are interested in producing “Dark River: The Fannie Lou Hamer Story”.